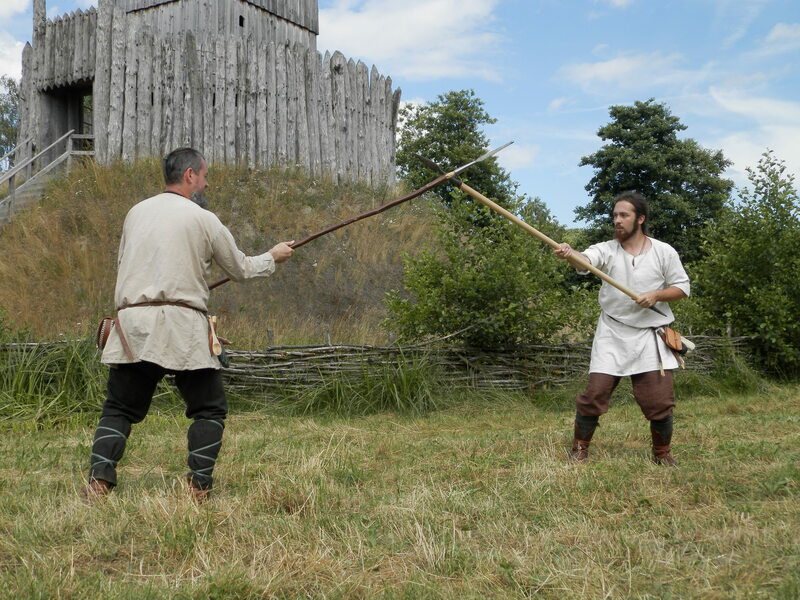 Roland Warzecha – Dimicator, on the individual combat with a round „Viking“ shield and an early medieval sword. The seminar took place in Geschichtspark Bärnau in Germany. 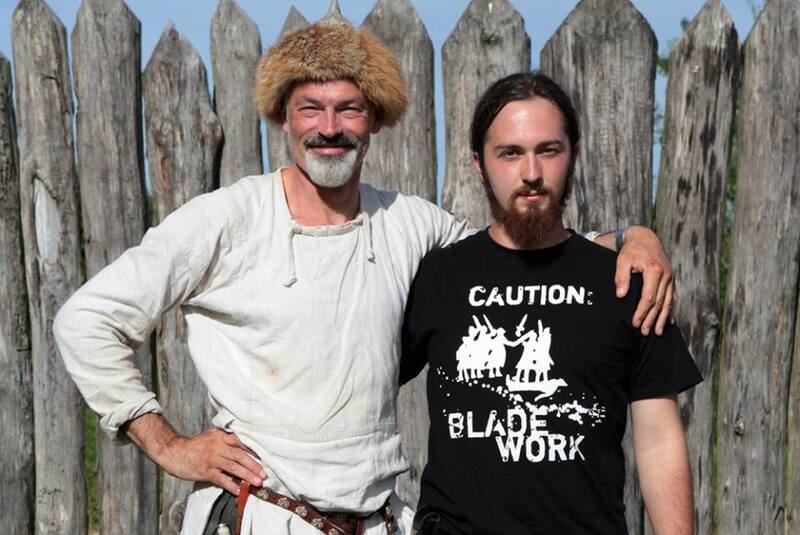 Roland Warzecha aka Dimicator is a Viking age and 14th century reenactor, historical martial arts instructor, illustrator and historical combat and weapon researcher from Germany. He leads a Historic European Martial Arts (HEMA) group in Germany that focuses on the reconstruction of the combat with sword and buckler from I.33 manuscript. 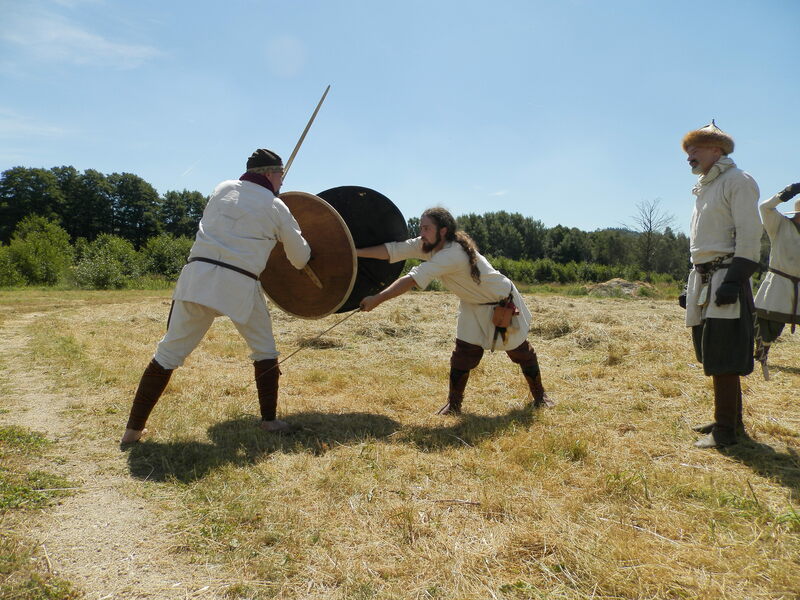 Despite the fact that I.33 reconstruction is the main interest of Dimicator, his reenactment beginning was in the Viking age reenactment and he is still engaged in the reconstruction of the shield and sword combat of the early medieval age that is still quite unknown. Dimicator presents his conclusions via his YouTube channel, social media and classes. 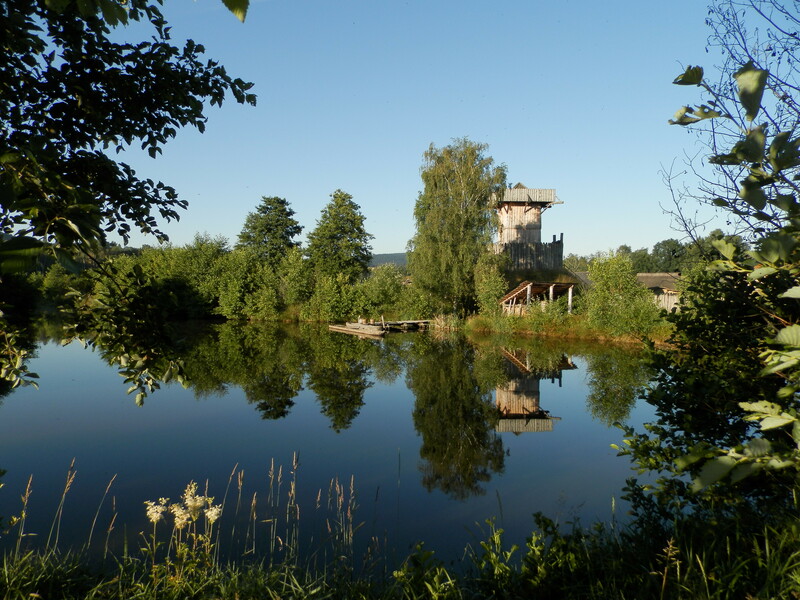 The seminar was set in the beautiful landscape of Geschichtspark Bärnau in a small town of Bärnau in Bavaria, Germany. 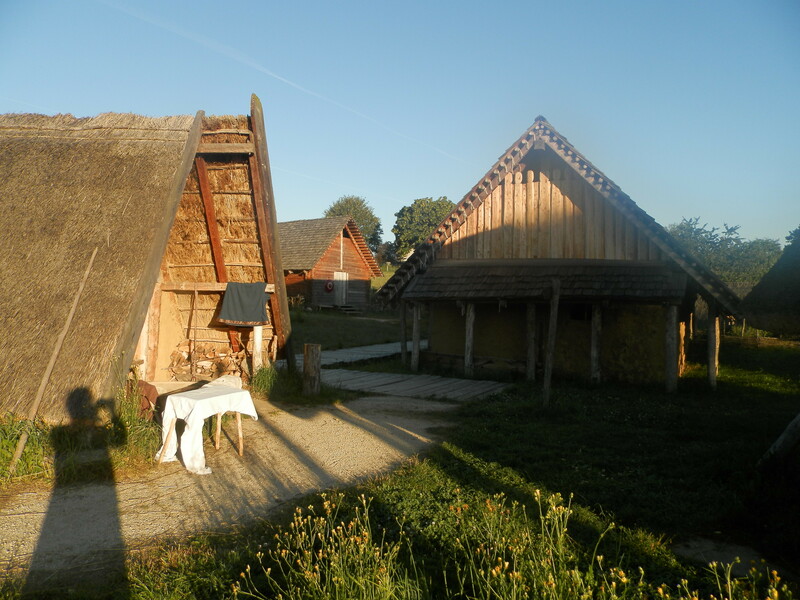 The „Geschichtspark“ or the open-air musem of the medieval village offers two sets of historical settlements. The first one is set in the 13th century equipped with period buldings, period field and a nice inn. 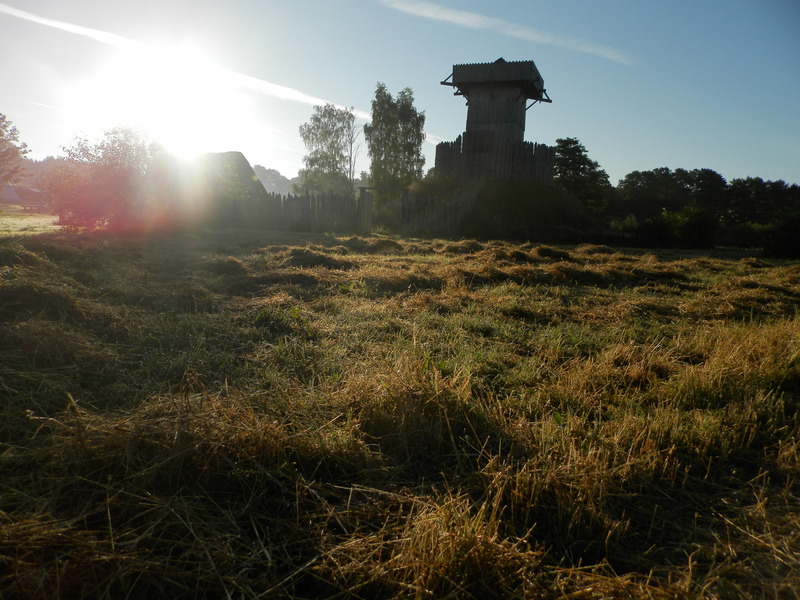 The second one represents Slavic village from the 9th/10th century with several buildings, gardens, livestock and a majestic Motte and Bailey guard fortress and a wooden church. I and my girlfriend packed the car and departed at about 14 pm from Bratislava, Slovakia. After about 6 hours ride we arrived to the site and set up a tent. We were welcomed by Roland and introduced to Germans that participate on the reconstruction of the park in Bärnau Susan and Michael, Michael and an italian reenactor David. After a short evening in Michael´s house everybody went to their beds for Roland promised us that the next day will be quite exhausting. Our „training day“ started at 10 am with a briefing from Roland´s part after three more participants joined us. Roland explained us the basic ideas of his research, basics of martial arts, distance, control etc. The first weapon we trained with was a spear. According to Roland it is the ideal way to learn distance, binds and appropriate use of leverage. As I had very little knowledge of it (mostly theoretical), it was very interesting for me to hear and try it in person. half-speed tempo in the sparring. Provided all the conditions and restrictions given by the authenticity I find this method very useful and I plan to use it in the future. After eating my lunch – dumplings with cabbage that my girlfriend cooked meanwhile in the longhouse, we resumed our training. A little bit more of spear freeplay and we continued with swords and shields. First we tried to apply the binds to the swords and then to shields. 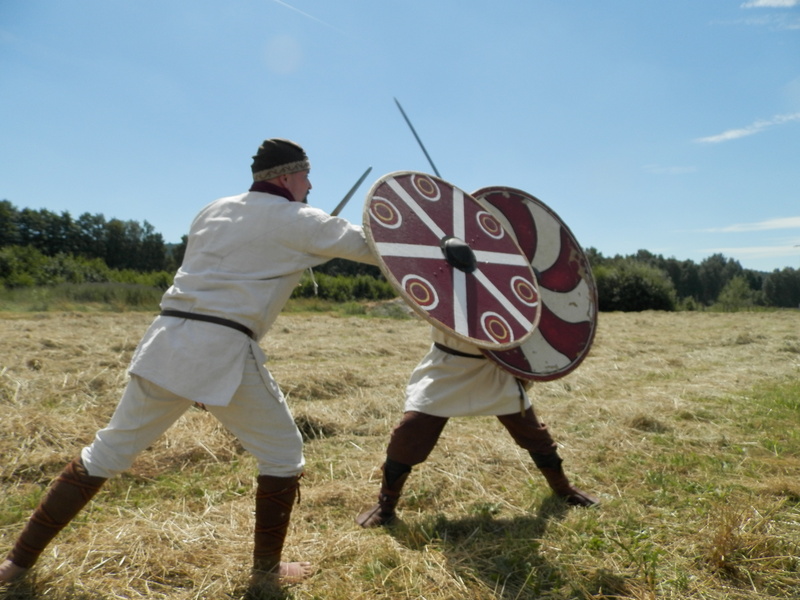 The essence of the early medieval combat as seen by Roland, dwells in the active use of a shield – Viking shield with a centre grip equipped with a boss. He considers the shield the main weapon of a warrior and emphasizes the use of the edge of the shield and the flat in a similar way as with swords. The idea is to use the „shield to shield“ binds by analogy to the sword fencing. 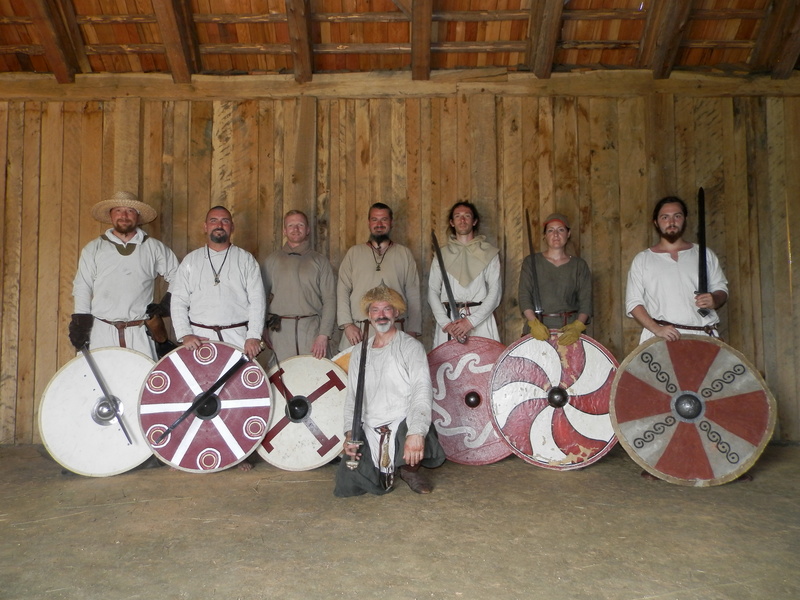 I briefly identified my shield as suboptimal for this kind of training as it´s weight is far more than the original finds and their replicas used for this kind of training. My shield weights cca 5,5 kg while the ideal for the training is 4 kg and less. It is also important to mention that according to Dimicator, for the shield to be used in this system and to benefit from the use of leverage, the shield should be no smaller than 80 cm but could be as big as 110 cm in diameter. To the end of the day we managed to learn two techniques of a sequence of techniques for the shield and sword and at about 17-18 pm we called it a day and seeked refuge for our sore shield hands and faces burnt by the sun. The training was indeed a wonderful experience. Exhausting but wonderful. But what came next was without doubts at a similar level of pleasure because Roland arranged us a feast in the neighbouring 13th century tavern. The feast consisted of roasted pig with awesome cabbage and a barrel of great german beer. The dinner in the company of such merry fighters was most agreable. Later we moved to the Slavic part of the museum to the longhouse where we continued drinking beer talking in the shine of the fire pit and enjoying the great feel of the day and company. One of the many highlights was when the participants started singing old songs in English and German. The experience was truly marvelous. On Sunday morning we resumed our training again. The sun was blazing even more but we kept training with short breaks in the shadow while discussing theory. During the day we learnt next techniques in the sequence for the sword and shield and we managed to experience a bit of a freeplay with these weapons. As I could see, one has to train hard to endure this much of the training with a shield and also the possession of an adequate shield is crucial. As the sun did not give us a rest we moved to the close 9th century church where we found refuge and place to train a little bit more, to improve our techniques and for more of a freeplay. As the shadows grew longer, the fatigue from the two days of the class grew too. Our concentration on learning new thing decreased and Roland took us to do some „fun“. He stood on the bridge of the watch tower and challenged us to defeat him in order to advance to the tower. One by one we tried the freeplay with him, several times losing our fight until he was defeated. This was also a new experience, fighting in the concealed environment of the bridge and it´s limitations significantly changed the conditions for the combat. Next we climbed the stairs of the tower and stood on the palisade to be challenged by Roland one last time. 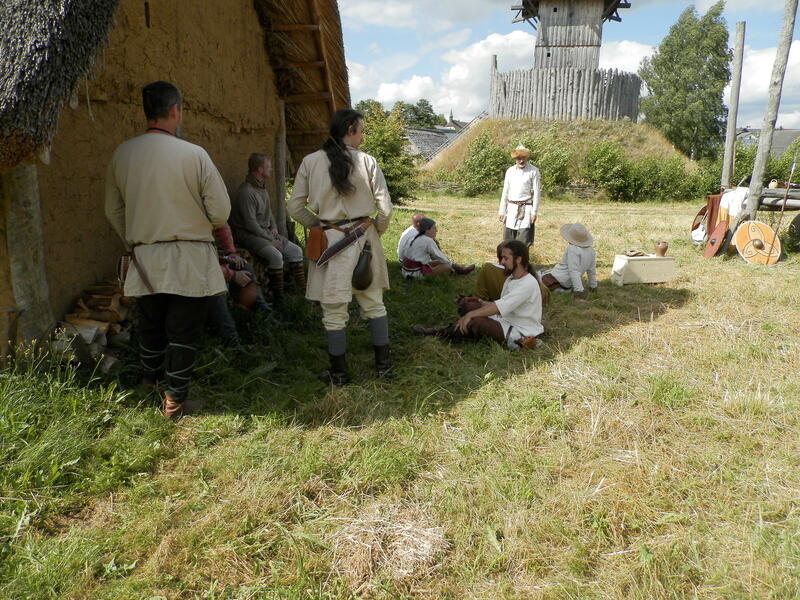 We fought Roland and also other participants several times, both enjoying the view from the height of the palisade and experiencing these new conditions and limitations for our movement and weapons. The walkway on the palisade was particulary narrow. This sparring was both amazing, tiring and sad because as we descended from the tower, we knew it is the time to bring this seminar to the end and to head home. At about 17-18 pm we packed all our belongings to the car and we had to thank Roland and bid our farewell to the whole company of good fighters and reenactors that took part on this class. early -medieval combat, but when it comes to close contact and binds, I find this interpretation very useful and applicable. 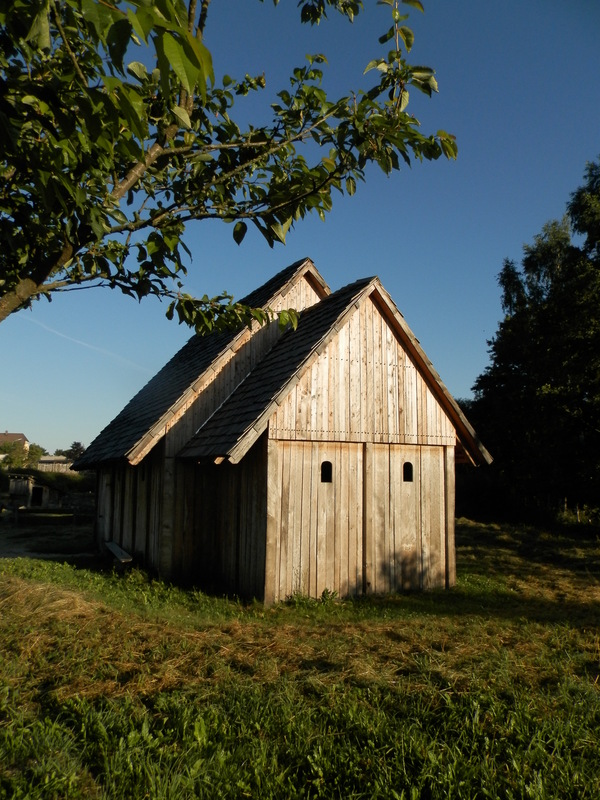 This entry was posted in Nezaradené, Podujatia and tagged archeoskanzen, barnau, dimicator, Geschichtspark, Geschichtspark Bärnau, meč, meč a štít, meč štít, reenactment, rekonštrukcia, roland.warzecha, seminar, shield, štít, Svjatogor, sword, sword & shield, sword and shield, sword shielld, trening, viking, vikinský, vikinským, workshop. Bookmark the permalink.